GIS helps determine the varying climate conditions individual trees experience in complex mountain environments. Using mountainside temperature data, ArcGIS Spatial Analyst spotlights summer variations of several degrees for individual trees. ArcGIS shows that over centuries, positions of trees have fluctuated up and down the mountain slope as temperatures changed. Minimum temperature anomalies are derived using topographic indexes in conjunction with relatively cheap temperature loggers arrayed over a rugged mountain landscape. These anomalies can be used to understand the microclimates experienced by individual trees. These trees, and others like them, represent an amazing opportunity to unravel a tricky problem: How do we better understand what the climate was like in the times before instrumental records? Some ancient trees can be considered the rain gauges and thermometers of the past. The annual layers of growth (tree rings) put down by trees are influenced by the environmental conditions during which they form. There is abundant evidence that tree-ring width in dry regions can provide a first approximation to the total rainfall over an interval of many months. In the high northern latitudes and in alpine tree line ecosystems, tree-ring width most closely approximates summer temperature. But, of course, trees are not rain gauges, nor are they thermometers. Trees are biologic organisms potentially subject to the influence of multiple environmental and biologic factors that affect their growth during their lifetimes. It is the job of dendrochronologists (dendro = tree; chronology = time) to interpret these growth records. 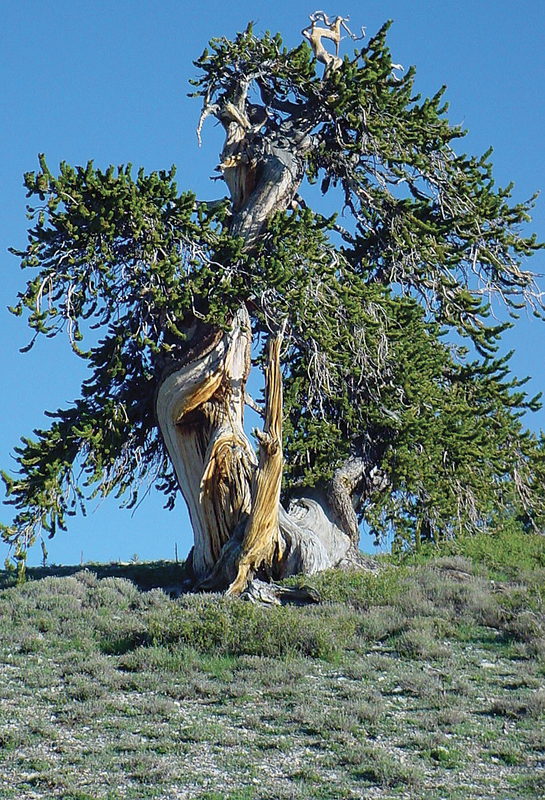 This ancient bristlecone pine (Pinus longaeva) growing near the top of Mount Washington in the Snake Mountain Range in Nevada is very near the upper elevational limit of growth for the species. It is trees like this whose ring-width records reflect past variability in temperature. Work done at several universities, but most notably at the University of Arizona’s Laboratory of Tree-Ring Research, over the last 50 years has shown that the growth of ancient bristlecone pine (Pinus longaeva) growing at the highest elevations in the mountain ranges of the Great Basin in western North America is sensitive to temperature. Recently, researchers have become more interested in exactly which individual trees are most sensitive to temperature and how a spatial approach can improve understanding. For instance, using ArcGIS for mapping (through an Esri university site license), recent research has shown that the position of the trees themselves on the mountainside have fluctuated up and down the mountain slope as temperatures have changed over the last several thousand years. There are stands of dead, twisted, and gnarled trees rooted in the ground more than 100 meters above the current tree line. These dead trees are reminders that the earth’s climate is dynamic. They were alive during a period called the Holocene climatic optimum—a warm period that lasted from about nine thousand to about five thousand years ago. The climate then was more suitable for these high-elevation trees (summers were warmer), and the tree line was higher than it is today. As the earth’s orbit changed over thousands of years, the climate cooled, and those trees eventually died. However, these mountains are so dry and cold, and the bristlecone pinewood is so tough, that the wood has remained on the landscape for thousands of years. The record of growth in those rings speaks volumes about how climate has changed in the past and how it might change in the future. 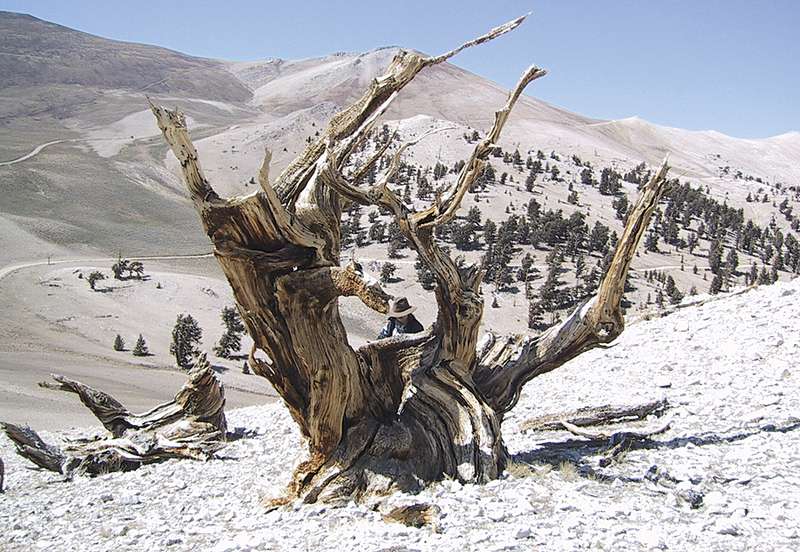 Dendrochronologists strive to develop the best possible tree-ring chronologies of year-to-year changes in temperature obtainable from ancient bristlecone pine. Meteorological records of temperature from actual thermometers are only available for these regions for roughly the past century. A much longer time frame is required to adequately understand the evolution of the earth’s climate. By using the bristlecone pine chronologies as a proxy record of temperature, tree-ring scientists can better understand how variable the earth’s climate has been over several millennia and test climatic theories and output from climatic models that many view as important for the future sustainability of modern society. 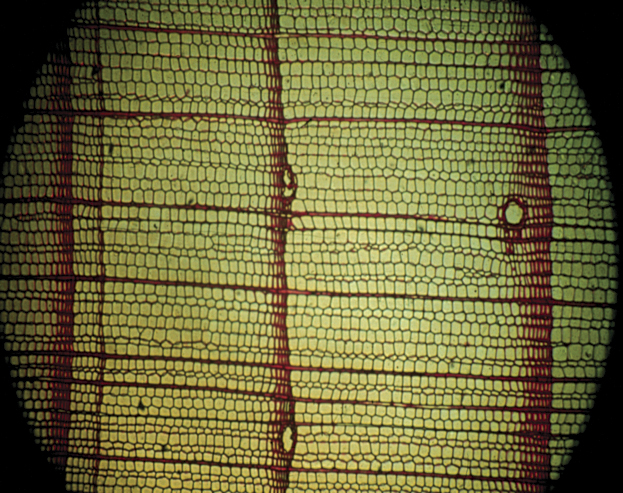 Tree rings are produced annually as large thin-walled cells grow during the early part of the growing season, followed by smaller cells with thicker walls as the end of the season nears. The ring boundary is the abrupt change in cell size from the small thick-walled dark cells to the large cells formed at the beginning of the next growing season. In this image, the direction of growth is left to right, and the large openings are resin ducts. Note that some annual rings are relatively narrow and some are relatively wide; this is the result of different climatic conditions encountered during the growing seasons. For decades, dendrochronologists have been working with the long bristlecone pine record to infer variability in past temperatures—if you can build a mathematical model between current climate and tree growth, you can apply that model back in time and determine the climate. But the challenge is in knowing exactly which climate variables are limiting a tree’s growth. As the botanical and ecological literature can attest, cambial growth (tree-ring width) in high-elevation trees is a complex biologic process. Thus, the most appropriate trees must be selected for field sampling—trees whose annual growth rings will reflect variability in past temperature rather than, say, variability in growing-season soil moisture. The advent of precision GPS and detailed elevation models help determine which trees are the best temperature recorders based on their precise location. GIS technology can help determine the climate conditions that individual trees experience in these rugged and complex mountain environments. 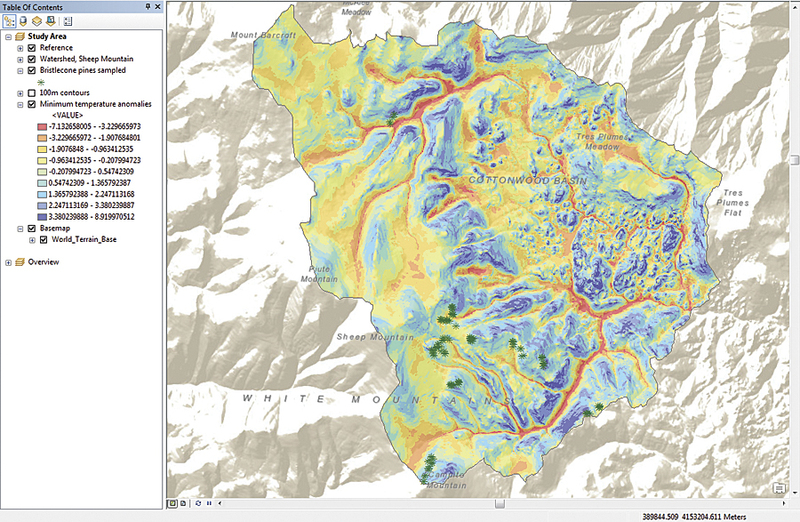 For example, micrometeorological models of temperature anomalies from cold air pooling, solar radiation models (like the Solar Radiation toolset in ArcGIS) that take topographic shading into account, and remotely sensed information on the timing and direction of water from snowmelt all can be used to determine the physiological factors limiting tree growth. More specifically, combining data from inexpensive temperature loggers deployed on the mountainside with the hydrologic modeling tools in the ArcGIS Spatial Analyst extension shows that individual trees are experiencing variations in minimum daytime temperatures of several degrees in the summer. A tree growing in a colder microclimate resulting from cold air draining down the mountain might be limited by temperature more so than one of its neighbors growing only a few meters away if that neighbor is located on a patch of ground that is relatively warmer by comparison. Indeed, the ring widths of trees growing on the same mountain slope vary in conjunction with their biophysical setting in predictable and measurable ways. Determining exactly which climate variables were limiting growth was not possible at such a fine scale before dendrochronologists began to exploit the power of geospatial data. Now that these tools are becoming easier to use, the collaboration between those that are interested in time and those that are interested in space is poised to move the field of paleoclimatology onto firmer, clearer ground. This very large dead bristlecone pine (Pinus longaeva) in the White Mountains of California stands at an elevation over 11,500 feet above sea level and looks down on the harsh tree line environment. The ring series sampled from this tree date from 663 BC to AD 1024. Dr. Matthew Salzer is a dendrochronologist with the University of Arizona’s Laboratory of Tree-Ring Research and an expert on paleoclimatology. Andy Bunn is an environmental scientist at Western Washington University who brings geospatial tools to bear on a variety of ecological questions. He’s been using Esri software since the command line days and currently uses ArcGIS 10 on a site license for Western Washington University. For more information, contact Matthew Salzer, University of Arizona’s Laboratory of Tree-Ring Research, and Andy Bunn, Western Washington University.